When changing to a raw food diet, you may wonder, "Are raw peanuts dangerous?" There are many myths surrounding raw peanuts and raw peanut butter. Both are usually safe but do have the potential of posing health risks. 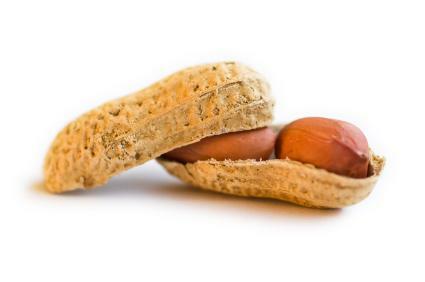 Peanuts are actually legumes, not nuts. Most raw nuts are quite safe to eat. Raw peanuts themselves are not toxic and are safe to eat. However, they can be contaminated with a mold called Aspergillus flavus which produces a chemical called aflatoxin, a potential carcinogen that can cause health problems in people and animals. Fortunately, aflatoxin is one of the most studied toxins in the world. Cornell University has an extensive amount of information devoted to aflatoxin on its website, and many other reputable universities and scientific organizations also freely share information about aflatoxin. Peanuts grow underground, and when they're harvested, they may be contaminated with Aspergillus flavus. There are other strains of molds now identified as potential creators of aflatoxin. As part of their life cycle, molds produce and excrete various substances, and these strains excrete aflatoxin. The chemical remains on the raw peanuts after harvesting and may then be consumed by people or animals. If the infected peanuts are made into a product such as raw peanut butter, the aflatoxin also becomes part of the product. In the United States, the U.S. Department of Agriculture tests and monitors peanuts moving through production facilities nationwide. If the amount of aflatoxin is greater than 20 parts per billion, they order the peanuts destroyed. Amounts below that are considered reasonably safe. Aflatoxin causes liver damage. If an animal is exposed to aflatoxin in great amounts or over a long period of time, it can cause liver failure and liver cancer. Processing peanuts through heating, roasting, boiling, or pasteurizing the peanut product can reduce the molds, which are killed by high heat, and thus reduce potential aflatoxin exposure. The USDA's monitoring program also reduces the likelihood aflatoxin creeps into your jar of peanut butter. Raw, living-food diet followers need to exercise some care and caution when choosing raw nuts and legumes for consumption. Yes, raw peanuts can be consumed. Government regulation and monitoring reduces the likelihood toxins are in the bag of raw peanuts you just bought at the supermarket. However, like any monitoring program, it catches many problems but may also miss some. Anyone eating peanuts, peanut butter, and peanut products, whether raw or cooked, may take in a little aflatoxin. The point is not to be scared of eating raw peanuts or peanuts in general but to avoid long-term or high levels of exposure. Eating a handful of raw peanuts a few times a week probably won't expose your body to enough aflatoxin to cause ill effects; eating raw peanut butter three times a day for years may. Be careful about buying peanut products from overseas sources, too. Some countries also have strict monitoring systems in place, but others may not. Cheaper imported products may not always be a good idea. In general, the answer to the question "Are raw peanuts dangerous?" is no. They are not poisonous, and it is unlikely you'll get a huge amount of toxins from eating a handful. The smart raw, living-food diet adherent will eat a variety of raw nuts, seeds, and other plant foods and not rely upon one legume such as the peanut for protein.